Blake Burzell, seen here earlier in the week in first playoff game against Covina, was the second highest scorer Friday, Feb. 19 against Atascadero with 12 points. 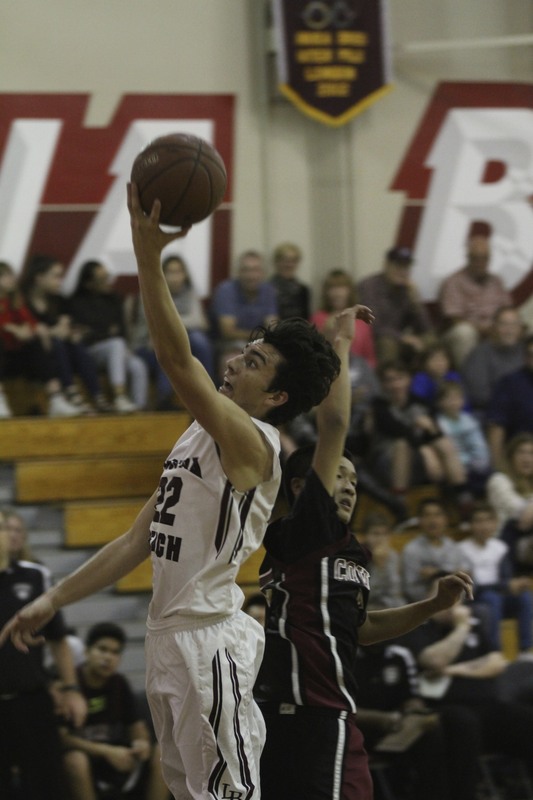 The Laguna Beach HIgh School boys basketball team survived the 258-mile drive to Atascadero to beat the 10th ranked Greyhounds 52-32 Friday, Feb. 19. Breakers never trailed, leading 19-6 after the first period, 28-14 at the half and 45-25 after three quarters. The trek was not the longest ever for a Bret Fleming team. In 1991, Fleming’s team won in similar fashion after a 300-mile drive to Bishop, beating the Broncos 79-55. Bishop no longer is in the Southern Section and now competes in the Central Section. Seventh-ranked Breakers host second-ranked Harvard-Westlake on Tuesday, Feb. 23, 7 p.m. at Dugger Gym.